Most fake tags do not qualify as obstruction. However, just because obstruction and fake tags don't mix at the professional level doesn't mean the obstruction call should be foregone in scholastic or youth baseball. Here is a discussion of the obstruction rule differences, by level of play that delves into a core baseball philosophy: the pros are expected to have situational awareness while younger levels may be more forgiving. OBR/Professional: Like most monikers in baseball nomenclature, Obstruction is described in the Definition of Terms section of the rules book: "OBSTRUCTION is the act of a fielder who, while not in possession of the ball and not in the act of fielding the ball, impedes the progress of any runner." A fake tag certainly satisfies the "not in possession of the ball" (and potentially the "not in the act of fielding the ball") criterion, but the key consideration here concerns impediment: did the fake tag impede the progress of any runner? Under professional rules and standards, this impediment generally must be physical in nature: the runner's progress is physically affected by the fielder's illegal actions. The most often case, of course, is a runner colliding with a fielder without the ball and not in the act of fielding the ball (see "Reviewing Jim Joyce's Game-Ending Obstruction Call" from the 2013 World Series for an example of this type of obstruction, and an explanation of what "in the act of fielding the ball" actually means). A classic case of Obstruction. Obstruction, naturally, can also occur with no physical contact between runner and fielder: a fielder standing in the runner's way, which inherently forces the runner to alter his/her route may also be deemed as impeding the runner's progress, with or without contact. The final case of obstruction concerns an even smaller part of the definition: "progress of [a] runner": what is progress, anyway? Progress is a runner's attempt to advance (or retreat): we're looking for a bona fide illegal action on the fielder's part that plainly inhibits the runner's ability to engage in this voluntary activity. For this voluntary action to occur, the runner must intend to progress (or stay put, as the case may be). This principle is very similar to that discussed in Case Play 2017-2 - Stealing an Extended Walk: in pro ball, it is up to the offensive player to know the situation, unless the defense's illegal actions obstruct him/her from acquiring that knowledge. The MLB Umpire Manual specifies the specific case of obstruction when a "fielder's actions are a deliberate effort to block the runner's view." This may occur during a fly ball if the third baseman intentionally attempts to block the baserunner (R3)'s view of the play in the outfield or a first baseman jockeying in front of the baserunner (R1) so as to block his view of the pitcher on a pickoff play: the key is that the runner is hindered from engaging in the voluntary activity of timing the tag-up, or seeing the play in front of him/her. 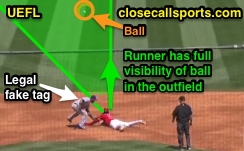 If the play is ordinarily accessible or visible to the runner, but the runner "bites" on the fielder's fake and looks at the phantom tag instead, there can be no obstruction as the runner was not physically impeded from seeing the ball/play. If the runner, due to a fake, does not attempt to advance or retreat, then that runner's progress cannot possibly be impeded. In the attached play (Rangers-Angels, Andrus/Maybin), had baserunner Maybin attempted to advance to third base and been impeded by fielder Andrus' actions, only then would obstruction have been the proper call. A deke or fake on its own, however, is entirely legal in MLB. For more on obstruction, see "Rule 7.06 [now known as Rule 6.01(h)]: Obstruction, What a Pickle!" For more on A vs B obstruction, see "Type A: BR Overlay Obstructed on Ground Ball to Infielder." Table of Obstruction Rules Differences. NCAA: College baseball actually has a rule specifically for what MLB interprets as visual obstruction: "Visual obstruction by a defensive player may be called if a fielder interferes intentionally with a base runner’s opportunity to see the ball on a defensive play" [NCAA 8-3-f]. Other than that, NCAA is similar to OBR in regards to obstruction. NFHS: The biggest difference at the high school level is that in addition to the above obstructions, a fake tag is considered obstruction (Rule 2-22-2). Nearly all other fakes (e.g., simulating a caught fly ball, faking a throw [other than pitcher/balks], etc.) are legal; the phantom tag, though, isn't. Federation also outlaws verbal obstruction, whereas NCAA and OBR do not. As interpreted, "offensive players [in NCAA and Pro] are expected to know the difference between their coaches' voices and the voices of their opponents." In high school, however, that's verbal obstruction. Note About Verbal Interference: Under OBR, there is no such thing as verbal interference, but under NCAA (specifically, Rule 2-50), visual or verbal acts to hinder or impede the defense, by definition, constitute interference. NFHS, obviously, makes illegal both verbal obstruction and verbal interference. 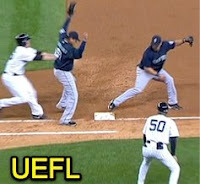 Accordingly, verbal conduct by the offensive team designed to confuse the defense (see: A-Rod yelling "Ha!" 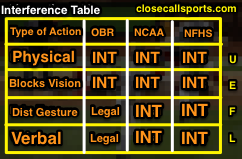 while running past a fielder) is legal under OBR, and illegal under both NCAA and NFHS, as far as a call of interference is concerned. Obviously, if the content of the utterance is objectionable in another sense (e.g., profane or unsporting), then the umpire may warn or eject the offender for unsportsmanlike conduct, as in Rule 8, but may not rule interference. Verbal Interference Case Play: With one out and one on (R1), the batter hits a towering fly ball to the left side of the infield. As the fielder entitled to protection from interference prepares to catch the batted ball in flight, baserunner R1 runs by and (A) yells or says "Ha!" at, (B) yells or says an obscenity at, (C) deliberately jumps in front of or places his hands in front of the fielder's eyes ("face guards"), or (D) runs into the fielder, who, in turn, is unable to catch the ball. What is the ruling for each level of baseball? (A) (R1 yells at fielder): Legal play in OBR, interference in NCAA/NFHS. (B) (R1 curses at fielder): Warning or ejection at all levels. No INT in OBR; INT in NCAA/NFHS. (C) and (D) (R1 face guards or contacts fielder): Interference at all levels of baseball.